Cajun Navy to the rescue in the Carolinas. I just give me some updates on the storm right now we're looking at about seventy mile per hour wind gusts the storm is moving at. Three miles per hour so incredibly slow part of what's making it. So dangerous and we just got a tweet from the president saying. We love the cajun navy. Very topical because our next guest happens to be Josh Reshard from the cajun navy in just. You guys do so much just a group of volunteers normal citizens who grab your goats and go out and help people in need in times like this what are you seeing in this storm. I think it's important to understand. Occasion that are leaves an organization that. You know we like to work with local municipalities and get there are no sharing of what they're attacked. Other kind of attack is in so we come into an area that we knows potential for devastation. We like to coordinate our efforts so what we're looking that now is you know lumber and is obviously in an end and one of are more concerned areas. Where all we already know and the roads county area and we know that there's going to be. Really Heidi you know above average what states in those areas so we're preparing now to enter the accounting and really take command. From the local municipality is up to the city up to the regional to the state. And that what are you hoping to accomplish once you get there. Sure why I think I get our efforts are best coordinator when we talked to a local municipalities and so what we're hoping to his aid and just again enhance what the local plan will be and so we have boats on the ground we have boots on the ground. In our efforts again are going to be focused on getting low low low lying areas and some of the places where to put as simply cannot get out. In storms like this yeah people all over the country often have the urge to help and they don't know how. And sometimes the efforts to attempt to help can actually do more harm than good how do you guide people in terms of doing things they'll actually be beneficial to those who need it. Yeah that's occurred question we actually have a request for rescue on our web site. We can go to cajun navy released dot com and request that you can also sound to be a volunteer. You can donate with a PayPal link as well. I'm too little lot of ways that we encourage people to do it. But it have to be responsibly. And not be proactive in the middle a storm like this we don't like to give out specific locations because we don't wanna be inundated with a volunteers that have been vetted properly. This would really urge the public. To calm goes a proper channels which would be your local municipalities. And or our website specifically. You kind of engage with us on a level where you need us most. And based on your experience with storms like this any advice or some of these residents in these areas. Yeah I mean you know just com bunkered down you know we we expect though the worst to come over the next several days. We don't know this is going to be Harvey asked Aniston's of it being heavy precipitation over a long arm where there. Storm stalls. That's what we're anticipating. Were hoping that we can get in these areas quickly. And does do is done you know to the vest at a weekend. In this given situation. What you do amazing work and we very much appreciated Jaffa Sharpton occasion navy just amazing what you guys do with your own equipment with your own time. And to the people that you help appreciated and we extend our appreciation to as well thank you jobs. Oh. Myrtle Beach's shops and restaurants are shutting down in preparation for Hurricane Florence. 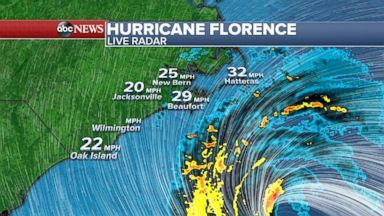 Dangerous winds and torrential rains are predicted for the Carolina coast even before Hurricane Florence hits, ABC News' chief meteorologist Ginger Zee reports.